Amid growing concerns over possible safeguard restrictions on Samsung and LG’s washer sales in the US market, the US state governor and congressman openly expressed their opposition to the move claiming it will only increase consumer prices, reduce consumer choice and constrict foreign investment in the nation. “Although I advocate fair trade, (Samsung and LG’s) case doesn’t seem to be the subject to safeguard restrictions. 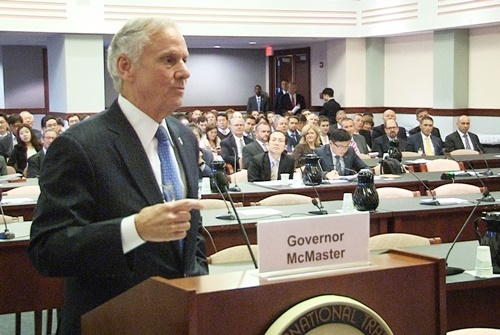 I stand here to oppose the trade restriction on Samsung in any kind,” South Carolina Governor Henry McMaster said at the public hearing held by the US International Trade Commission on Thursday. He added Samsung is expected to create around 1,000 jobs within two years by building a plant in Newberry County, South Carolina and the high tariff on the Korean tech firm will be a huge blow to the regional economy. Henry McMaster was among other US politicians cautioning against the protectionist move. Bob Rolfe, commissioner of the Tennessee Department of Economic and Community Development, also said LG Electronics’ building a plant in Tennessee should be regarded as the US production base as it will strengthen the base of the US washing machine industry. The safeguard is thus unnecessary, he added. Samsung announced in June it would invest $380 million in building a new plant in South Carolina by 2020. LG has set aside $250 million to build a plant in Tennessee by 2019. The US state governors and congressmen expect the plants will create thousands of jobs and boost their regional economies. On Oct. 12, Whirlpool further asked the ITC for a punitive tariff of 50 percent on Samsung and LG’s washing machines and parts over the next three years. The Korean firms have refuted Whirlpool’s claim, saying the high tariff will hurt their operations in their US plants. Based on Thursday’s argument, the ITC is to vote on what remedy to impose on Nov. 21 and make its written recommendation to President Donald Trump by Dec. 4. The White House will have sixty days to review the recommendations and make a final decision. If the safeguard restrictions are invoked, the US government may impose or increase tariffs on Korean firms and limit their imports to the US. Samsung and LG’s combined share of the washing machine market in the US rose to 31 percent in the first half of this year from 23 percent in 2014, while Whirlpool’s share dropped to 37 percent from 41 percent during the same period, according to the US market research company TraQline. The two Korean firms are estimated to have shipped $1 billion worth of washing machines to the US last year.